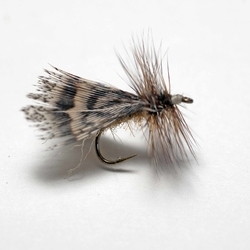 By far the most important group of caddis flies throughout the season. Body is usually cinnamon brown. Wings are brownish gray with small tan spots and blotches. Legs are cinnamon brown. The larvae are net makers. Pupae swim to the surface and emerge in open water. Females dive under the surface to lay eggs. When they are finished, they drift on the surface with the current. Several species are important on the Henry’s Fork, Madison, South Fork, and other local waters. June through September. Most emergence occurs in the evening, but can occur in the morning or mid-day. Egg laying can occur morning or evening. Medium to fast water. Larvae need clean gravel to build their nets. 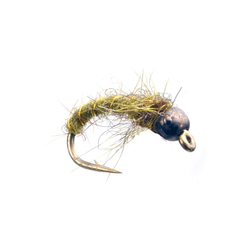 The Spotted Sedge produces some of best caddis fishing. 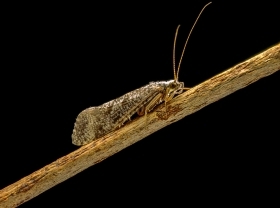 During emergence the emerging pupal imitations are effective when fished just under the surface. 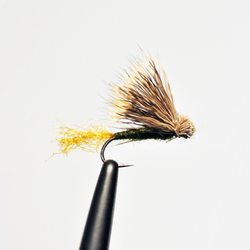 Spent and diving caddis patterns are effective during the egg laying flights.